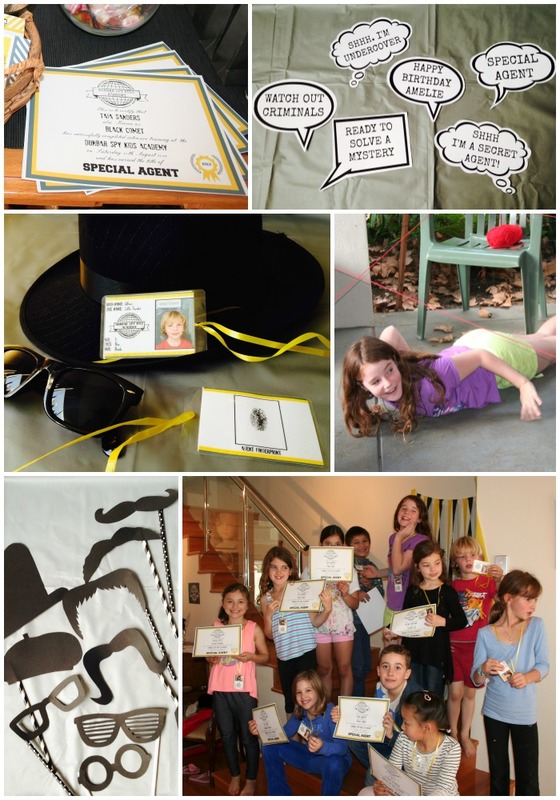 Last year we threw a Spy themed party for our middle daughter when she turned 8. We invited both boys and girls and it was a big hit with everyone! I tried to tie in the games with the theme, as well as keep with a colour scheme of yellow, black and white. Not at all a girly party, but that’s what she wanted and she was over the moon! I made a party plan for the afternoon, so I could tag out with Hubs when I needed to organise food and the kids ID cards. I set up the activities as missions, each one contained in a manilla folder and looking very official. A couple of the missions were left out in the rush, but I was glad to have them there just in case. There’s nothing worse than the kids expectantly asking “What’s next?”! When they arrived the guests had to do a special knock on the front door, then tell me the secret phrase so I knew they were official trainee agents – we had given them a puzzle to solve with their invitation, just to set the mood! Once inside, we took their photo and a fingerprint, ready to make their ID badges with. Then they could either mingle or do a word search puzzle while they waited for all the everyone else to arrive. 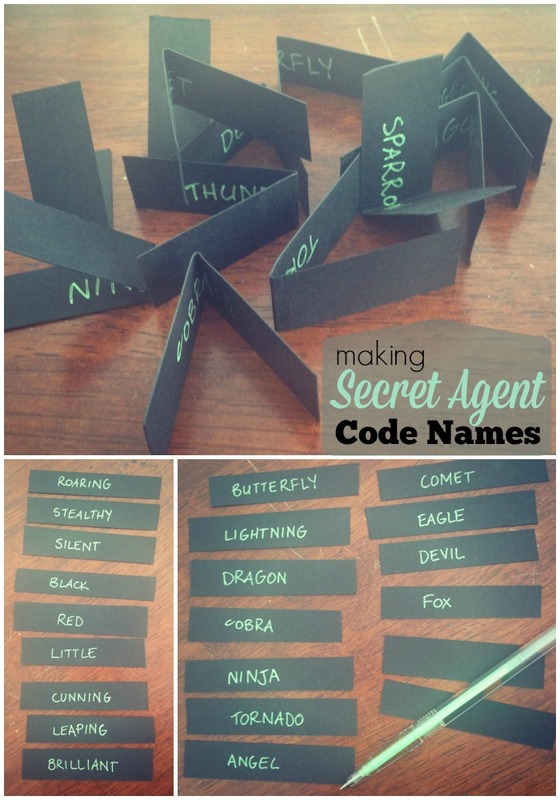 Once all our trainee spies were present and accounted for, they received their secret code names. We put the first and second parts of the code names into two cups, and our secret agents took turns pulling out a word from each cup. The kids loved all the combinations that came up, like Roaring Dragon, Black Comet, Flaming Sparrow and Magic Cobra to name a few. I was going to have a challenge where the kids could only refer to each other by their code names for the whole party, but that went by the wayside in all the excitement. Maybe that would be a good idea for slightly older kids with better attention spans! 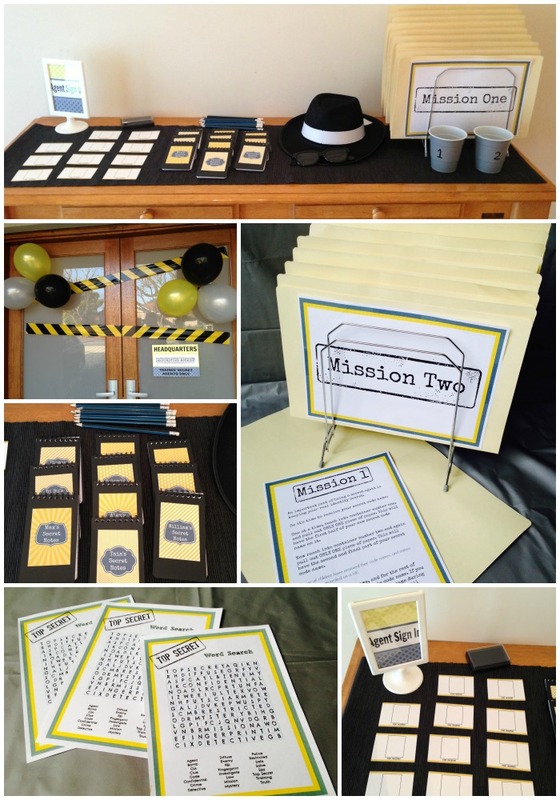 Other missions included fingerprint analysis, getting through a field of lasers, code cracking, a disguise relay race, brain training (name the missing item on a tray! 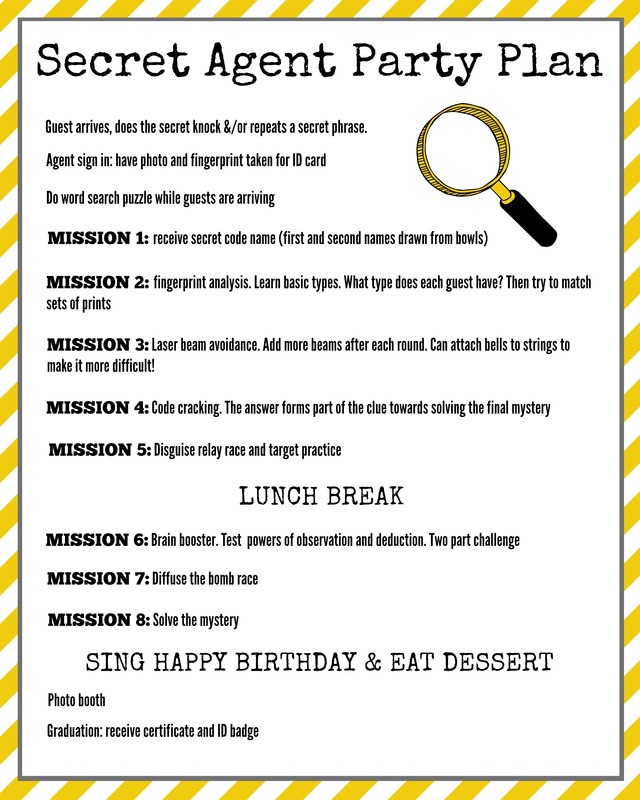 ), diffusing the bomb race, and finally solving the mystery of which cake had dots and which had squares hidden inside (I ran out of time to think of a better mystery to solve – oh well!). I also set up a photo booth with some cutouts of glasses, hats, speech bubbles and moustaches to play around with. At the end of the party the graduates each received a certificate and their ID card. And to think we were originally going to have an Alice in Wonderland or Peter Pan party! She changed her mind so many times! Next birthday I think I’m going to choose for her, and let it be a complete surprise! How much easier would that be?! !